A couple weeks ago, the General Science Fiction Book Club met to discuss Kim Stanley Robinson’s 2312. 2312, the 2013 Nebula Award winning novel, is a classic, world building novel. There’s a bit of murder mystery, a bit of universal disaster, and bit of environmental commentary. Our reading group agreed that the most interesting aspects of 2312 were the creative means of (literal) world building. The inhabitants of this universe have found a way to turn asteroids into miniature worlds… and depending on the creator of the world, each has the ability to be as fantastical or realistic as the inventor’s will allows. Robinson uses a unique method of “Lists” and “Extracts” to fill out his universe. Some of our readers that are more familiar with Robinson’s other novels thought that this was a creative way to limit himself from rambling too far off track of the story. In general, we thought it was a well constructed novel. And if you’re a fan of exploring a world to its fullest extent, 2312 will be one of your new favorites. We will be reading The Clockwork Man by E.V. Odle this month and meeting on June 23rd at 7pm to discuss. I hope you’ll join us! If you’ve watched America’s Test Kitchen as often as I have you would know why I was so excited to see this book on Ada’s shelves. They’re the people behind Cooks Illustrated who are passionate about the science that takes ingredients from bland to ba’zaam! In this review I hesitate to label The Science of Good Cooking a “cookbook” because it’s more like an epic reference of cooking methods and ingredients. There are scientific diagrams that break down what is happening when food meets heat and similarly what happens when food is chilled down. The book also breaks down different animals by structure all while tossing in some of America’s Test Kitchen’s perfected recipes. While it starts with meat-heavy recipes and may seem to be only for culinarians, The Science of Good Cooking is for bakers as well and really for anyone who wants to step up their cooking game. My favorite part of the book is the “Why This Recipe Works” section after each recipe which forces some logic into what might have been grandma’s hand-me-down recipe. In that spirit, the authors thoroughly examine the methods you use in their recipes and show how you, the chef, can and will use all of your senses when preparing meals. 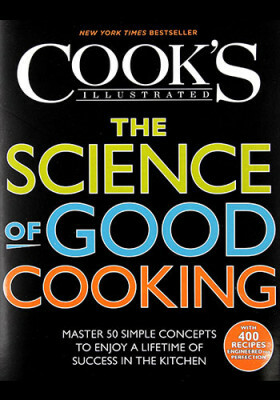 The Science of Good Cooking can be just a good cookbook to have on the shelf as well as an awesome resource for learning more about cooking, food, flavor combinations, and your favorite recipes. 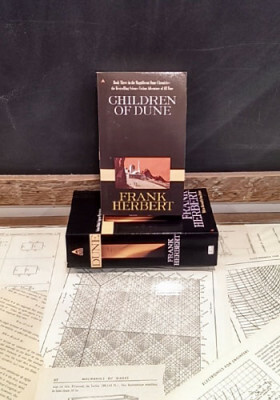 On Thursday, May 28th, the Dune Book Club met and discussed Frank Herbert’s Children of Dune. The third installment in Herbert’s series begins nine years after Paul Atreides steps down from his Regency at the end of Dune Messiah. Paul, blinded, walks into the desert, leaving his twin children in the hands of the Fremen. His sister, Alia, takes his place as Regent of the Universe. Similarly to Alia, the twins, Leto and Ghanima, are awoken by spice in the womb and are thus considered “pre-born”–resulting in their ability to see prescient visions, not unlike their father. Children of Dune begins with the unanticipated return of Lady Jessica to Arrakis, who is motivated by the fear that Alia and the twins have succumbed to Abomination. During Paul’s absence, the planet of Arrakis underwent a transformation that is a direct consequence of Muad’Dib’s jihad. The terraforming of Dune lends credence to Alia, Leto, and Ghanima’s concern that the sandworms will begin to die, leading to a depletion of spice, the essential component of space navigation and sustenance to native inhabitants of Arrakis. Amid worrying about the loss of spice under Alia’s leadership, a new religious player emerges, protesting and urging against the religious and government institutions–especially those that attack traditional Fremen beliefs. All the while, House Corrino of the neighboring planet Salusa Secundus is plotting to assassinate the twins and seize power over the universe. The reemergence of familiar and minimal new characters makes Children of Dune a comfortable expansion of the known universe without getting bogged down by too much new information. Though there are layers of religious, political, and ecological conversations, Herbert doesn’t go so in-depth that the exposition becomes tedious, as sci-fi can sometimes wont to do. Instead, Herbert gives readers a chance to create their own in-depth experience of the Dune universe by allowing their imagination to fill in gaps and flesh out implied ideas. Much of Children of Dune is instead a fountain of dialogue and characters’ inner contemplation. In this way, it analyzes society’s progress following the presence of Muad’Dib and how it affects the relationships between the Atreides family members and consequently the entire universe. The fast pace and familiar setting makes Children of Dune easy to engage with the major, over-arching themes of Dune. Each novel in the Dune Chronicles so far, though perhaps especially Children of Dune, has given readers a look into how planets ecologically evolve in tandem to its denizens over time–an idea that hits close to home. With the next book in the series leaping 3,000 years ahead, Children of Dune feels like a turning point–a climax in the universe that has me excited to find out where Herbert is going to take us next. Join us on Thursday, June 25th at 7 pm for our first discussion of two about God Emperor of Dune, book four in the Dune series. On Wednesday, May 20th, the Classics of Science Fiction Book Club met and discussed Olaf Stapledon’s story of near and far future, Last and First Men, originally published in 1930. Our conversation partially focused on wrangling Stapledon’s 2 billion year timescale and 18 different iterations of human kind and partially unraveled into an enjoyable conversation about the transforming (and transformative) nature of science fiction and the rapidity with which the genre has developed in tandem to the scientifically/technologically charged society of which it is a product. Last and First Men is challenging. If our individual sense of duration is based on our relatively short lives, then Last and First Men presents a timeline that falls far outside of what one may consider a long time (say, 100 years, for example). Stapledon defies our favorite story conventions and writes his book more like a non-fiction, and a non-fiction that assumes prior knowledge in addition to being fast-paced. There is no single protagonist, or even a few linked protagonists, but rather the entirety of the human species take on that role. The drama of humanity begins with a critique of the (at least) vaguely familiar (albeit it somewhat “uncanny valley”-esque) extrapolation of between-wars era global society and political structure and reaches out to Neptunian ancestors who have learned to access the totality of time through the power of humanity’s collective consciousness. Stapledon’s prose can be crispy dry at times and then oddly poetic (though perhaps overly saturated with sentiment). On top of all this, most print editions have hokey covers and tiny typeset with tight margins. However, within all of these atypical characteristics that stand in contrast to a book eagerly consumed by a contemporary audience, and largely due to these characteristics, exists profound insight, nearly unfathomable imagination, and one man’s genuinely conflicted evaluation of the potentiality and shortcomings of human beings. A significant roadblock often hit by those who venture into Stapledon’s Last and First Men is inaccuracy. Admittedly, though I had read Last and First Men before, I found myself rolling my eyes at the notion of humans depending on coal power for centuries and cringing at the offensive, reductive characterizations of 20th and 21st century nationalities. While I contend that the value of a text goes far beyond its ability or inability to accurately describe the future, and that the value of science fiction lies within much more than its accurate depiction of science and technology (though “hard SF” is also enjoyable), these roadblocks are real. I’ve read elsewhere about Last and First Men that skipping the first 100 pages or so is a solid tactic for circumventing many of the frustrating inaccuracies, and I agree, though I do think the entire book is worth a thorough reading. The Martians, a strikingly alien species reminiscent of the sentient ocean of Solaris in how foreign both aliens feel, and the half-human/half-seal ocean dwelling subhuman Venerians are both “inaccurate” manifestations that are well worth exploring and considering in the context of the entire book, even if they will stand on their own. Last and First Men is my favorite of the books we’ve read this year, due in part to its challenge, but primarily because of its influence on the genre of science fiction. As one attendee at our meeting said, “Stapledon is an author’s author.” That is to say, what Stapledon lacks in execution and writing ability, he more than makes up for in imagination and ambition, two essential components of a writers’ inspirational drive. Join us next month, on thursday, June 18th, for a meeting discussing Ray Bradbury’s The Illustrated Man, a collection of thematically tied short stories exploring the nature of humanity, originally published in 1951. On Monday, May 4th, the History of Discovery Book Club met for a discussion of James Watson’s The Double Helix. 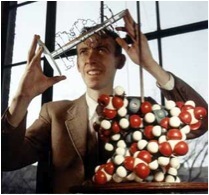 James Watson and his team made what is arguably the greatest discovery of the 20th century: proving that DNA is the building block of life and providing a solid structure for it. Watson’s short autobiographical account provides an in-depth, personal look into the discovery of DNA and reveals the politicking that occurs behind the scenes of academia. Watson is an excellent storyteller, something which cannot be said of most scientists. He successfully ensnares the reader into the drama of the moment, describing the personalities involved and their influence on the greater discovery. Descriptions of the molecular biology itself did sail far over my head at times but a reader who remembers high school chemistry or is more diligent about checking Wikipedia for clarification would not experience this speed bump in their enjoyment of this fascinating account. The young James D. Watson at work. Join us for our next meeting on Monday, June 1st at 7pm for a discussion of Marcus Wohlsen’s Biopunk. Last month, our General Science Fiction Book Club read The Martian by Andy Weir. 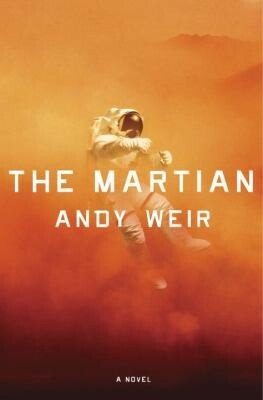 The Martian is Andy Weir’s first novel. It was published first as a series of blog posts on his personal blog, then as an ebook, and finally as an ink-on-paper novel. Not only has the novel won many awards, it is slated to become a movie later this year, staring Matt Damon. I say this to 1) Attempt to provide proof that the novel is quite good and 2) Explain how this was our most well attended book club ever. The Martian is a quick and super entertaining read. The novel begins when Mark Watney, one of the astronauts on the latest mission to Mars, is stranded on Mars after a freak accident. He has enough food and supplies to last him the original length of the mission (about 60 days). However, by his best guess, he’ll need to survive at least 4 years to even have a chance of rescue. The novel is compelling and seems to be quite accurate (as far as I can tell). As a former engineer, my favorite parts were all of the details in each and every hack made to save his own life. In our very well attended book club (over 30 people! ), not a single person disliked the novel. I highly recommend it. And this is definitely one you will want to read before seeing the movie. 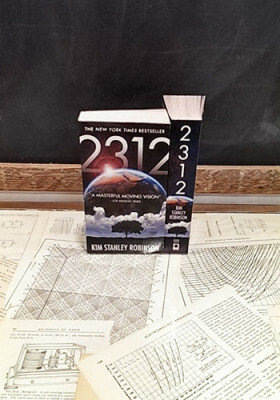 Join us next month on May 26th at 7pm for a discussion of 2312 by Kim Stanley Robinson. Hope to see you there! As I was thinking about my latest reads and which one I wanted to review, Saga vol. 4 instantly came to mind. However, I thought to myself, there’s no way I can review it because for sure someone else has already reviewed it for the blog. I was shocked to learn that it had not yet been reviewed. Yay for me! I get to be the first! 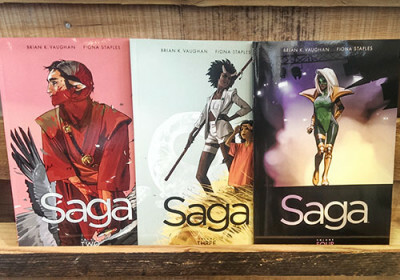 Saga is far and away one of the entire staff’s favorite reads. For example: When Volume 4 was released, I think we ordered 10 copies and every single one was sold in a day. That popular? You ask…. well, yes, but these all went to staff. Next time with Volume 5, we’ll order even more. So what is this amazing graphic novel series about? It’s a sort of fantasy/futurist Romeo and Juliet. In this version, although the love-birds don’t die in a fatal act of love for each other, their relationship seems to be just as tragically doomed from the start. Along with a compelling story line, the artwork is absolutely amazing. I’ve consumed each novel as soon as it came out. Every time I was left wanting more of the story and sad that I had to wait for the next installment. If you’re looking for a series that will inspire and as much as it entertains, look no farther than Saga. I can’t recommend it enough. 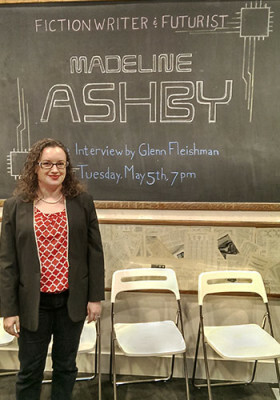 On Friday, May 17th, the Classics of Science Fiction Book Club met and discussed Joe Haldeman’s The Forever War. Haldeman’s military science fiction, originally published in 1974, is considered by some to be a response to Robert Heinlein’s Starship Troopers. While Heinlein’s book is easily read as casting military is a positive light, as the ideal path to self-improvement and active citizenship, Haldeman depicts the effects of military service a bit differently. Likely due to his being a veteran of the Vietnam War, Haldeman’s fiction is steeped in political, cultural, and moral conflict, exploring the implications of clashing civilizations through the experiences of the individuals caught in the thick of the fray. The Forever War follows William Mandella, a student of physics conscripted into the elite ranks of the United Nations Exploratory Force (reserved only for those with an I.Q. above 150) in preparation for an interstellar war with an alien species, the Taurens. Mandella lives through 1,200 Earth years over 4 subjective years, rising through the ranks from private to commander, experiencing the rapid transformation of a world left behind physically by space travel and mentally by extreme time dilation. Our group agreed that Haldeman’s prose is exceptional and his ability to communicate a complicated emotional experience in a few words or a described action generates within the text an almost palpable density. This density, the emotional depth and complexity of Mandella’s experience in The Forever War, is largely due to his brutal honesty. The combat scenes and subsequent deaths are delivered in a matter-of-fact style. Death simultaneously reads as an all-consuming horror and a reality as natural as breathing. While Haldman is not the only author to handle death in this fashion, remembering the time period during which Haldeman was writing and The Forever War was published gives his frankness an edge imbued with the horror that swept through most of the U.S. in response to a war televised in a way that no military conflict had been before. 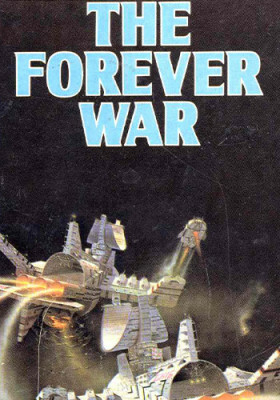 Haldeman’s The Forever War tops my list of favorite mid-20th century science fiction. The text is a literary achievement in its character depictions alone, providing the reader with an exceptional character in Mandella to whom a reader can still relate. The exploration of the effects of war upon an individual’s life experience, translated through the mechanics of time dilation and extreme future shock, is unique and powerful. Underpinning the more abstract and powerful themes is a thoughtfully delivered, easy-to-follow plot that makes it easy for a broad range of SF readers to experience what Haldeman has to offer. 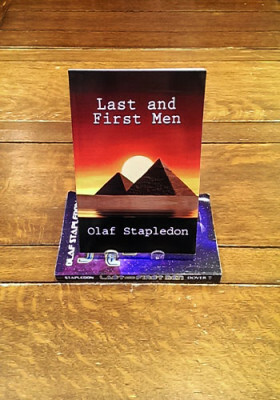 Join us next month on May 21st at 7pm for a discussion of Olaf Stapledon’s Last and First Men. Stapledon takes on a 2 billion year time scale, exploring 18 different iterations of humanity in his classic, genre-defining text written in 1930–a classic of 20th century science fiction if there ever was one. STUNG! On Jellyfish Blooms and the Future of the Ocean, written by Lisa-Ann Gershwin, opens up by knocking Homo sapiens off of their self-perceived podium of evolutionary victory by means of the revelation (or, for some, mundane truth) that spines are not necessary. At one point, so many millions of years ago, no organism had yet evolved a calcified apparatus we now know as bone. Invertebrates, like jellyfish, ruled the seas. Now, more than 500 million years later, jellyfish live mostly unchanged in our oceans and are poised for takeover. Why? Well, it turns out that our polluting of the seas, overfishing, ocean acidifying, and pretty much every way we are and are not affecting the ocean, is likely producing favorable conditions for jellyfish. This could(!) spell super-duper danger for us…or maybe not. (Spoiler alert: Stung! is often melodramatic and cheesy). As with many popular science books I have read, such as Janine Benyus’s Biomimicry, the premises proposed are generally promising. Unfortunately, these books can sometimes read like a food blog where the author frames information in a personal narrative, sharing how their shower was that morning and their kids slept in later than usual in an attempt to make the “technical” recipe more palatable for any lay reader. 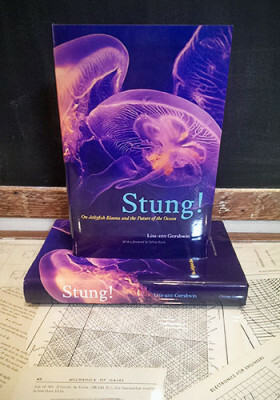 Which leads to my biggest complaint about the book: Stung! is rarely funny, but attempts jokes often. Gershwin tries writing in an accessible, “don’t be afraid of the big-bad-science” style that sometimes falls into reading like a forced colloquial tone. Overall, Stung! is definitely worth the read, especially if you pick and choose your way through it. It provides a solid introduction to the vast environmental problems our oceans, and thus we as a species, face. There is also loads of information about the ecology of the ocean, and a chapter after chapter rundown of how jellyfish are blooming more, why, and the potential consequences humans will face in the near to far future.